It’s hard to believe that another season has already come and gone. Chris and I both agreed that the season went by faster than we remembered in previous years. We had many highlights, in particular the raptors (I’d say my hawk nets paid themselves off with their catch of 4 Northern Harriers!) and our first banding record of Clay-colored Sparrow from August 29. This morning made us feel justified in our end date as there were very few birds about and we banded just 10. 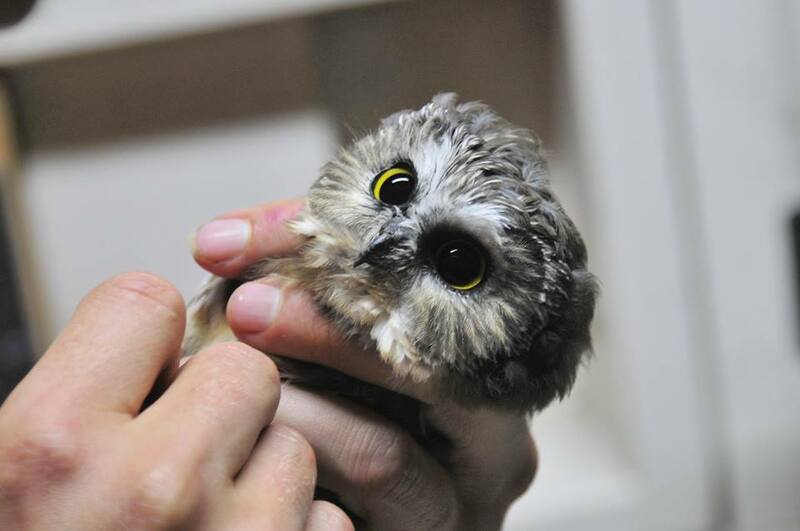 Owling last night produced a lone Saw-whet though the lunar eclipse made the time between net-rounds pass by quickly. We only got about 20 minutes of it at its full eclipse, orange phase, before it started to recede. As I have already recapped the first half of the season in our August 31 blog, the following will be a brief run down of the second half of the season. 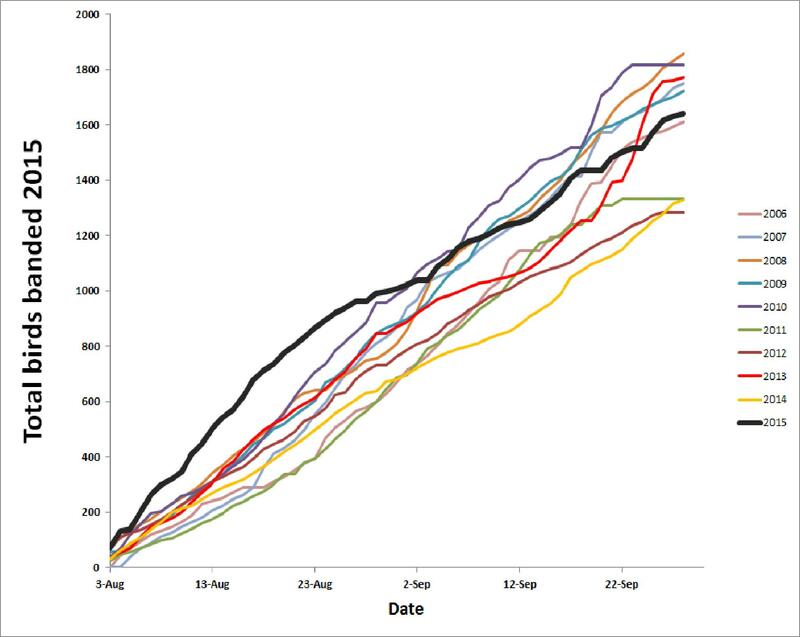 September started up where August left off, remaining fairly slow for the first two weeks but for a small peak from the 4-6 when we banded 117 birds in 3 days. From the 7-10 we had regular early morning visits from the BC Nature field trip participants who were enjoying the natural history of the valley. We don’t get a whole ton of visitors out here normally so it was fun to be able to show so many people what we do here. During the first week of September our number one catch was Lincoln’s Sparrow followed by a few days where Common Yellowthroats took over top spot. From about the 9th on though it was all Ruby-crowned Kinglets as we banded 170 in the final two and a half weeks! Our busiest point of the month was the 17-26 during which time we had 3 full weather days of no banding but still managed to band 280 birds. Overall it was a good season for sparrows as Golden-crowned Sparrow (14) and Spotted Towhee (10) had record years and rest were at or above average (excluding Lincoln’s Sparrow which slightly down). 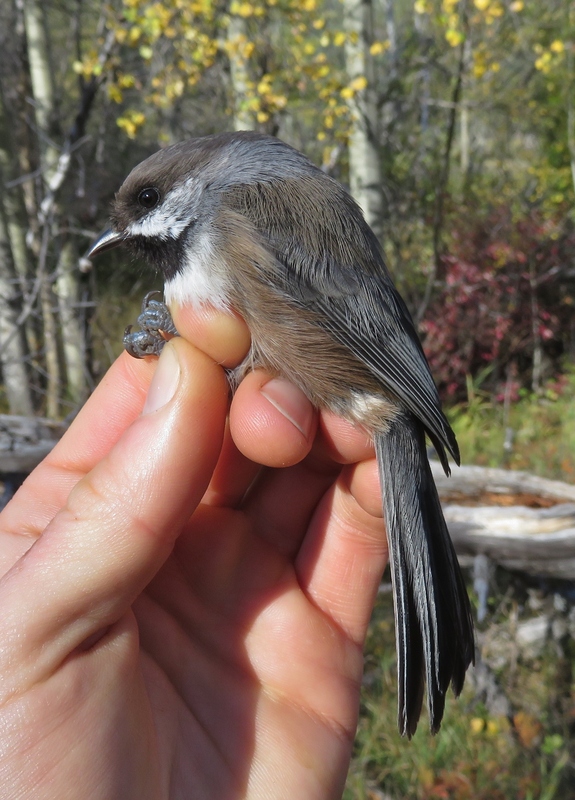 Our detections of aerial insectivores (flycatchers, swallows, swifts) were also above average which is encouraging as they has seen some of the steepest declines of any group of birds in North America over recent decades. Thanks to Roma Shaughnessy for these two photos from a couple nights ago! 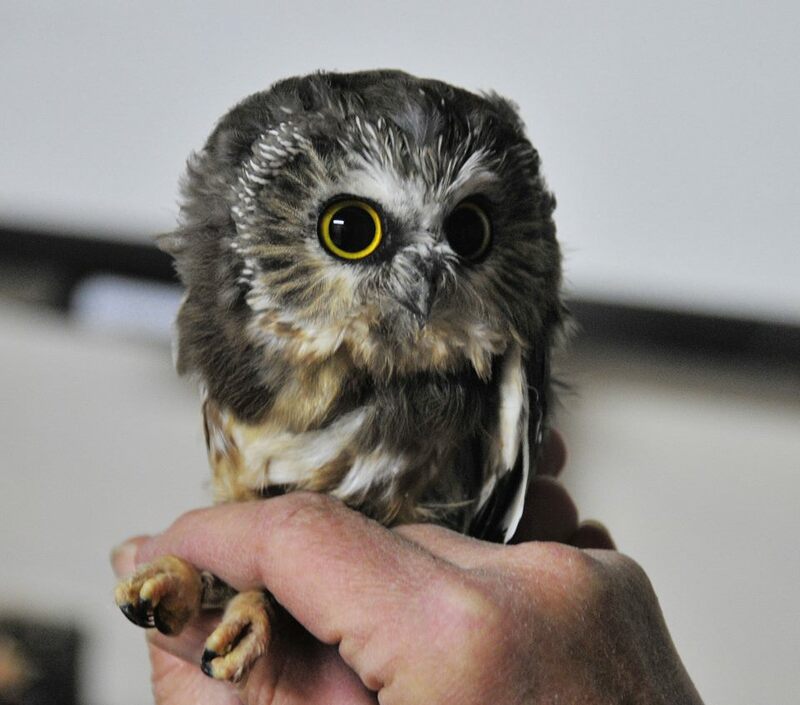 Owling kicks off in September and over 12 nights so far we have banded 15 Northern Saw-whet Owls with one last chance to add to that tonight. Thanks to everyone who helped us out this year and to all our readers (over 4500 views since the start of the season!) for following us on our adventures here. The future of TLBO is uncertain as the NCC tries to secure funding to carry on the project but we are optimistic that we will be back again in 2016! Sept. 27: A Snipe at Kickoff! Last night conditions were great for Owling and Chris did not disappoint his visitors who joined him as he ended up catching 4 Saw-whets, our best night of the season so far! The flip side of the cold, clear night meant that most of the songbirds apparently took off and our penultimate morning of the season was a slow one. 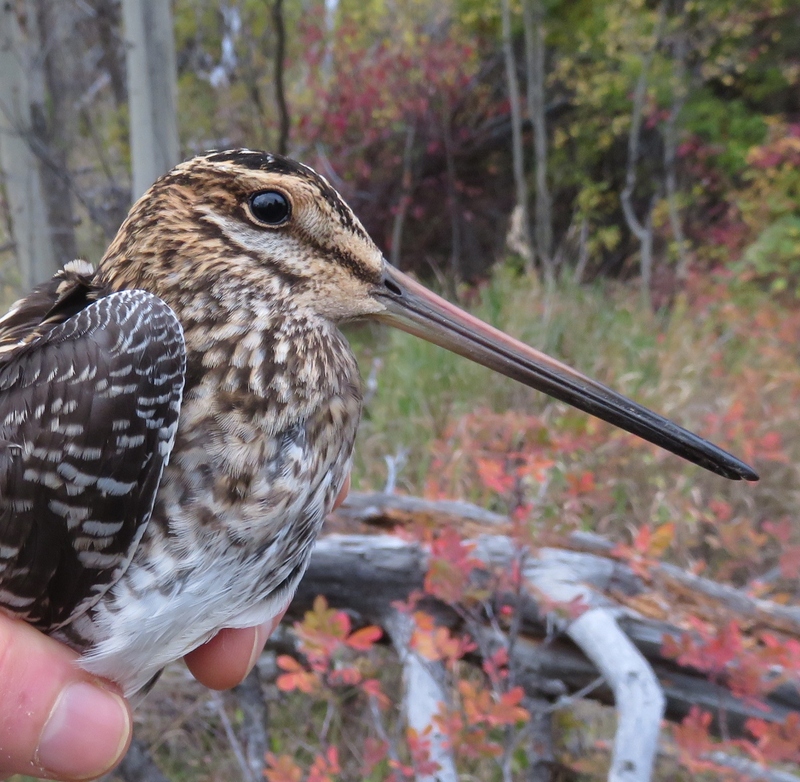 The best bird of the day was also our first one banded: a Wilson’s Snipe that I found bouncing around in net 9 on my first net round! This was just the second one we have ever caught and they are a species that we don’t record that many of in a given year at the station. Chris had a couple nice sightings on census and on the walk back. These included an adult Sharp-shinned Hawk and our first Bohemian Waxwing of the season. On the back of our sighting of the big flock of Bohemians at Chilko a few days ago, I would have expected to have recorded more around the station by now. Still, it was our 136th species recorded at the station this season, continuing our most diverse season in few years. The low activity gave me time to do some more veg. management on the final net that needed it, net 16. This is one of the nets that seems to benefit the most from maintaining a constant shrub height. Sept 26 – 72 net hours! For only the third time in two weeks, weather permitted us to keep all 12 standard nets open today for the prescribed six hours. It was a very nice change of pace to hit the 72 net hours mark again. In those 72 net hours we managed to band 45 birds and break the 1600 mark for the season. This is only the second time we have accomplished this feat in the last four years and we still have two days to go. Now we are hoping for 1700. Once again the flavour of the day was Ruby-crowned Kinglet as they accounted for just over 50% of the birds banded today as well as a sizable chunk of all the birds heard or seen around the station. 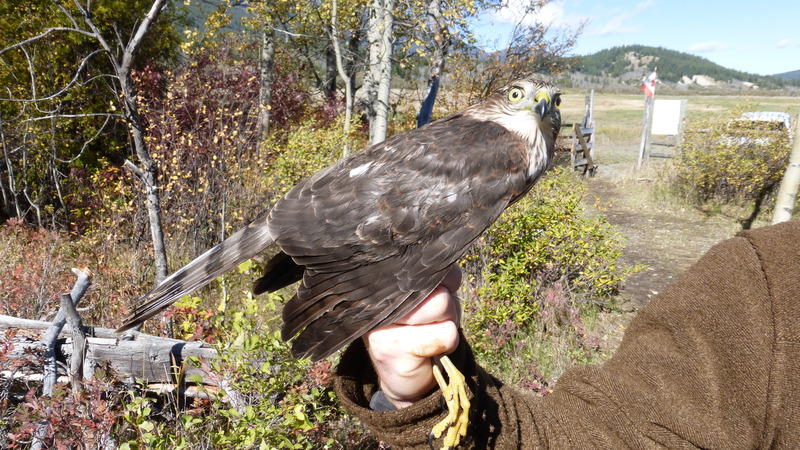 We also caught our seventh Sharp-shinned Hawk today. This was a big female and she was not very nice to the palm of my left hand. Words were said that cannot be repeated here. We have already banded more Merlin (1), Kestrels (3), and Harriers (4) than in any previous season, and we now only trail 2006 for Sharp-shinned Hawks by a single individual. Here’s hoping we can catch at least one more Sharpie in the next two days. Today Avery heard our first Northern Shrike and spotted our first Western Grebes on the lake. 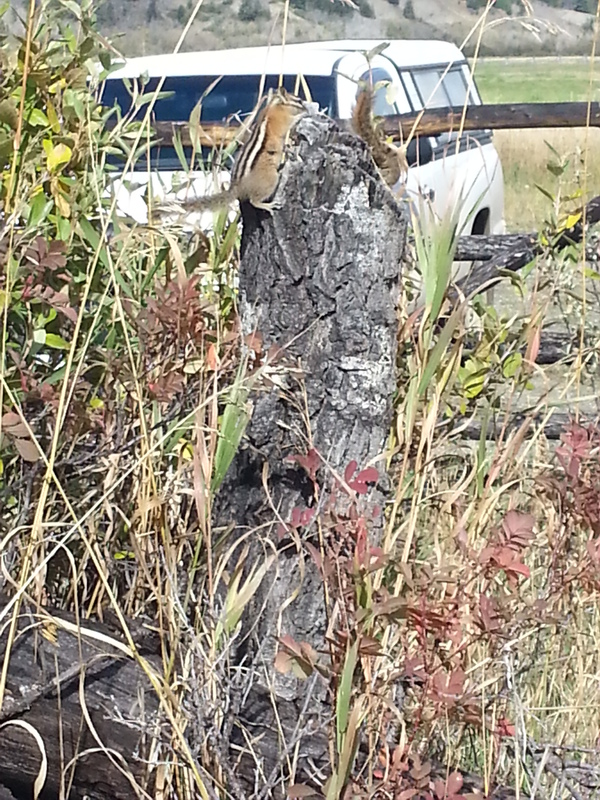 He also spotted his first White-throated Sparrow though we have had two previously. 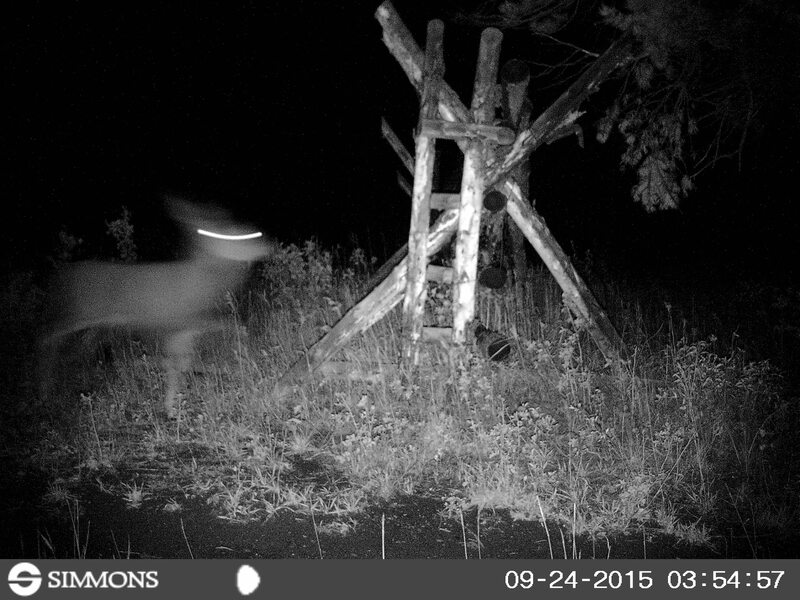 Five days ago I set up my trail camera on the gate we leave open to get to the banding station thinking it might act as a bottleneck for animal traffic. Boy was I right on that. In just five days the camera snapped 92 photos of animals passing through the gate. Unfortunately, every single photo was of deer, but some had personality. Overnight the skies more or less cleared and we were able to get back at it first thing this morning. With the rain yesterday and the just below freezing temperatures overnight a few of the nets were frozen closed and had to wait a couple hours before they thawed. This didn’t slow us down though as by the time Chris set off on census we had caught over 30 birds and I had to close most of the nets for 45mins in order to process them all. The activity was quite inconsistent as after re-opening the nets we hardly caught anything until around 1100 then we caught between 6 and 10 birds each of the remaining net checks bar one where I came back with zero! Once again we were mostly catching Ruby-crowned Kinglets, of which we have now caught 156 in our standard nets, including 29 today. If the remaining three days of banding are similar they might end up catching Swainson’s Thrush (204) atop the 2015 banding charts. Chris had a fairly uneventful census though he did find our first Horned Grebes of the year on the lake. On his way back to the station he ran into just our second White-throated Sparrow of the season. Typically we record several per year, a couple of which come from our nets, but this year has been a low one for them and we are still awaiting our first banded. It has been quite a good year for Mountain Bluebirds and we again had a few flyovers, detected by their distinct, soft calls. The near-miss-of-the-day goes to an adult Cooper’s Hawk that nearly hit one of our hawk nets as Chris was passing it. This would have been just the second ever banded at TLBO, but alas, not this time. Last night Avery was hoping to try for some owls, but the wind and rain prevented that. That wind and rain is still present so once again we were unable to band and all I could do was a wet census. I finished with 20 species despite the weather surprisingly, but nothing unusual to report. Crossing fingers for some improvement in the weather before the 28th when we pack up and head home. 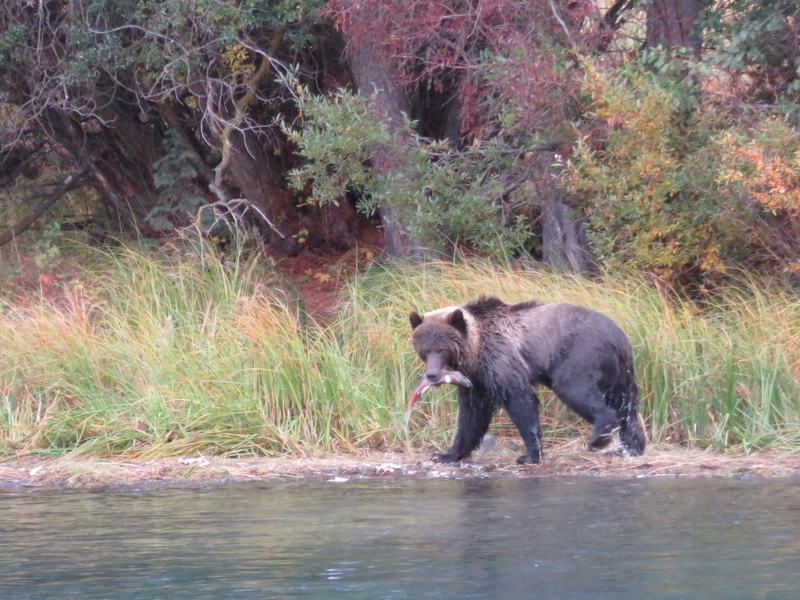 This big Griz had no problem catching fish…perhaps due to their being rather less than alive. As Chris mentioned in the last post, we were without power for most of the day yesterday. 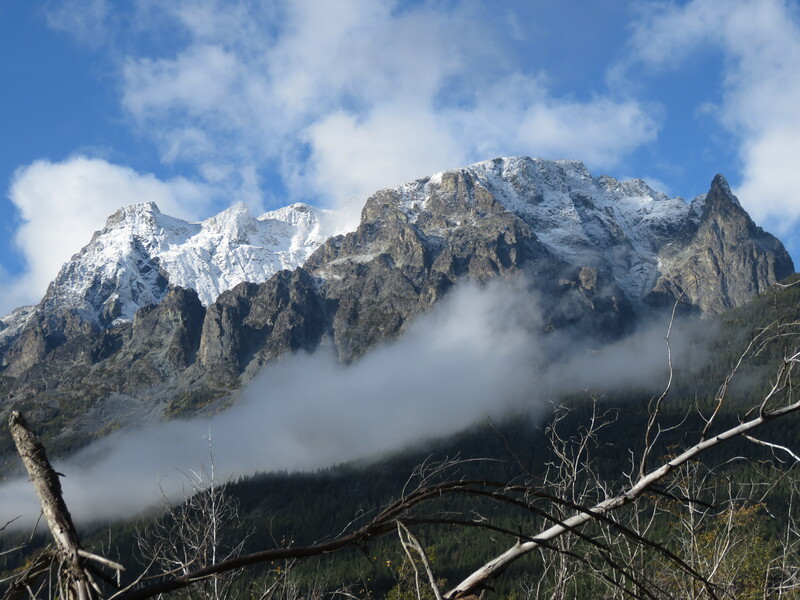 Alex and I decided to make the most of it and drove over to the Chilko River, in the next valley east of here, to look for Grizzlies. On the way we encountered a couple Bald Eagles and a flock of 75 or so Bohemian Waxwings, a bit early for this species in these sort of numbers I would have thought. After only a brief glimpse of a Griz we did eventually get great looks at one as it swam across the river and grabbed a couple salmon. As we were just leaving we found another female with two cubs, though they were more distant. Unfortunately the wind picked up just as I was arriving back at the station after census and we had to close the nets shortly after. I took advantage of the early closing to do a bit more vegetation management around nets 12 and 17. Well yesterday was interesting. We got home from work and found the power was out. It stayed out until just after we retired to bed for the night. Due to no power, no internet, and no light, yesterday’s blog was necessarily delayed until today. Also we had to cook dinner on a pilfered propane stove. Yesterday we started late due to freezing temperatures and finished with just 20 birds banded. The only unusual bird banded was a Hermit Thrush. Observations were similarly blasé with the highlight being a Great Blue Heron on census that had not been seen since September 4th. 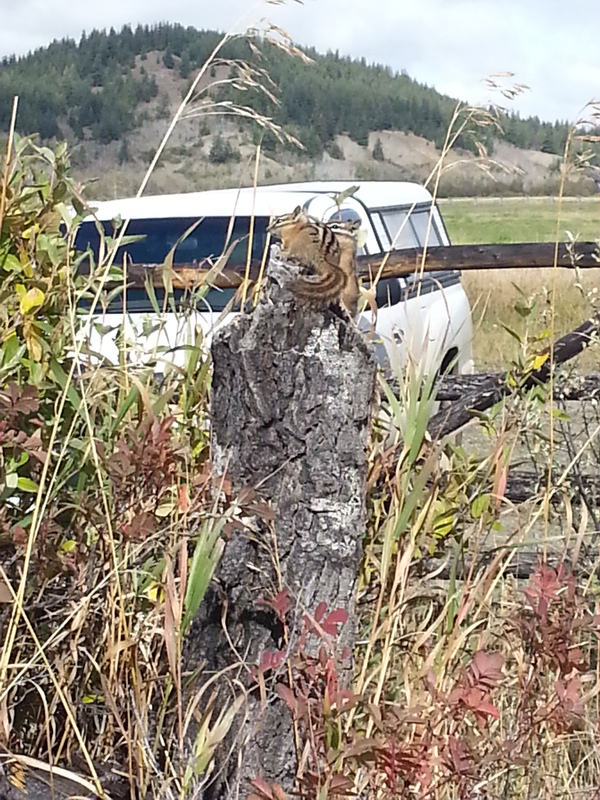 As the most noteworthy thing to happen yesterday was not very noteworthy at all, here are some cute pictures I took of chipmunks playing/fighting on a stump.